This editor is no longer actively participating and is unlikely to respond to messages left here. Otherwise, please post notices and inquiries only on the talk pages of the other primary verifiers. 19 Deletion of Die ersten Menschen im Mond. 39 I normalized titles. . .
59 Several varianting submissions . . .
60 Several varianting submissions . . .
63 Fritz Loewe = Loewe? 66 Publisher change and price added . . .
67 Der seltsame Fall des Benjamin Button . . .
Wiki editing help - Tips on how to use the wiki-specific features when editing wiki pages. Wiki Conventions - How things are usually done on this wiki. Note: Image uploading isn't entirely automated. You're uploading the files to the wiki which will then have to be linked to the database by editing the publication record. Please be careful in editing publications that have been primary verified by other editors. See Help:How to verify data#Making changes to verified pubs. But if you have a copy of an unverified publication, verifying it can be quite helpful. See Help:How to verify data for detailed information. Is there a title record for the exact title and is it by the same author? Yes: Is there a similar pub? Yes: Use the "Clone" function. No: Use the "Add Publication to This Title" function. No: Use the appropriate "Add New..." function. We fully understand that it is going to take some time to get used to how things are done here, but that doesn't mean we can't learn from the fresh ideas that newcomers bring to the table. When you're adding books from your collection to the database, here are the steps to determine whether you should create a new record or update one that's already in the database. Click on the Advanced Search link on the main page, and in the first section ("ISFDB Title Search Form"), search for both title (Term 1) and author (Term 2). Enter them exactly as they are stated on the book's title page, not its cover. If the search results in no matching title record, go back to the main page, and click on "Add New Novel" (or "...Collection", or whatever type of book you're entering), and create a new pub record along with a new title record. If you find that none of the pub records match your copy in these three criteria, click on "Add Publication to This Title" and create a new pub record. If you find a record that matches those three criteria, it's a good chance this is your book...but not always. Click on the pub record and see if the date field and any printing/edition data in the note field matches your copy. If the publication date and printing data matches your copy, look over every field of the record and see if there are any discrepancies between your copy and the record. If there are differences and the record has not been verified, click on "Edit This Pub" and make the necessary changes. If there are differences and the record has been primary verified, click on the verifier's name, which takes you to their user page. Click on the tab "Discussion" to go to their talk page and then leave a message explaining the differences and ask them to recheck their copy. If they're active, they should respond within a couple of days. If they're not active, leave a message on the Moderator's Noticeboard. If there are no differences, click on "Verify This Pub" and on the next screen click on the middle bullet of the first open Primary slot. Going back to Step 5, if the publication date and printing data do not match your copy, click on "Clone This Pub" and on the next page make all the necessary changes to make the record match your copy. I changed the titles for the interior illustrations according to the general rules of ISFDB (see here and scroll down for them and an example). Thank you for submitting the changes. Yes, please. I had to change the titles for interior art in your other submitted publications according to the rules of the ISFDB. Only if a work of interior art is explicitly titled in a publication this title is notated. Please imagine the artist's summary page with titles like "all interior illustrations referring to the three novels". In addition: please don't add author information to the notes of a publication or a title - I had to delete this. We have the heading of every author's summary page to add information about her or him (I already did this for Jim Grimm). Sorry, but I had to reject the submission - the book was already in ISFDB as Andromedanebel. If you are not sure about the title you may look up the publisher for publications in the respective year or the pub. series (here: Bibliothek der Science Fiction Literatur). You may reach a pub. series also via the publisher - if you don't want to type in such a long name for a series. An afterthought: you may have looked on Jefremow's summary page, while all published works are on Yefremov's summary page. But do click while on Jefremow's summary page on the link in the heading to the titles published under this 'pseudonym' or on the 'Show all titles' button on the left toolbar . . . I brought this up about a month or so back, but never got a response: you changed your birthplace to "Aachen, North Rhine-Westphalia (NRW), Germany". But in 1940, NRW had not been created. It is ISFDB policy to record the name of the birthplace at the time of birth. It is my understanding that Aachen was in the Rhine Province of the German Empire in 1940 (my research may be incorrect). If so, the birthplace should be "Aachen, Rhine Province, German Empire". If this is not correct, let me know. Thanks for "variantizing" 'Im Giftstrom'. Sorry, there were too much false titles to repair on my own, so I rejected your submission. 1) For example Schlichte Gedichte (1887) - poems with an (automatically) added date of 2011-00-00: this one would be entered only as COLLECTION Schlichte Gedichte with a date (to be entered by you in the date field) as 1887-00-00. You may want to add the individual poems (each one with the respective date as 1887-00-00 (or earlier if you have information about a previous publication). 2) Introduction (to collection 'Der Marsspion ...') would be have to be entered as Introduction (Der Marsspion und andere Novellen), probably with the date of 1908-00-00. 3) Five letters by Carl Grunert to Kurd Lasswitz (1903-1908) would have to be entered as Letters to Kurd Lasswitz with Carl Grunert as author, but better as five individual entries Letter to Kurd Lasswitz, Letter to Kurd Lasswitz  . . . Letter to Kurd Lasswitz  with the individual dates depending on the first publication of the letters (not their date of writing). 4) For Max Wulff's art there should be one definite title (not two): the one stated in the publication (which should be varianted if the same art is already in the database under another title). 5) Mr. Vivacius Style & Das weiße Rätsel has to be split up into two entries. 6) We notify all unknown art as by 'uncredited' (not (still unknown)). Deletion of Die ersten Menschen im Mond. If there's only Vorwort mentioned the convention for ISFDB is to enter likewise to this publication - that'd be Vorwort (Ich lebte im Jahr 3000) as by Eugen Sänger. (If there'd be only one preface written by Sänger throughout it would suffice to title it only 'Vorwort', the additional note in brackets really is only to differentiate with other 'Vorwort' titles by Sänger. I have approved of the new publication by Daniel Kehlmann. There's a possible problem with other publications within the pub. series: though this pub. doesn't belong (I think) to Phantastische Bibliothek, other pub.s would belong to both pub. series. Since this is a bibliographical site for spec. fiction it seemed reasonable to have Ph. B. as the one to put pub.s into. So, under this setting, 'Suhrkamp Taschenbuch' will be quite fragmentary and you may take into consideration to drop it. This is just a proposal, of course. 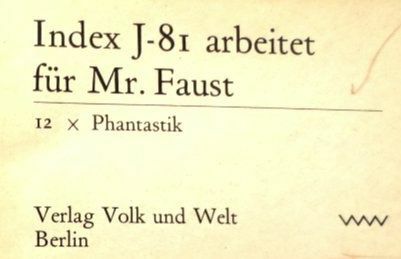 No, this 'Suhrkamp Taschenbuch 3847' by Kehlmann does not belong to the 'Phantastische Bibliothek'. But it belongs - I have read it- without any doubt to the genre of speculative fiction.--- Here once again the ISBN: 9783518458471. Sorry, if I made a mistake. There is no price mentioned, although I don't have the dust cover. Now to Heyne: Heyne did not have always the same series terms. The publisher changed it now and then. What I have written is the term in the book. One rule of ISFDB I was taught is to state what is really to be found in the book. That most of Kehlmann's work does belong to the fantastic or even science fiction is without question! Do you plan to enter other books by him? I planned to do more by him, but haven't come round to do it and even don't own all of his titles. !!! If I do remember correctly Mahlers Zeit was published before 2006 for the first time, so the title should be edited by you to display the year of first publication. Here is the link to the title. Re Heyne: Well, I don't have this book, but others from 'Science Fiction Classics' series should be similar to Der Tunnel: that is, they have 'Science Fiction Classics' on the cover and spine, but 'Heyne Science Fiction' on the copyright page. The problem (as with Suhrkamp Tb / Ph. B.) is that these books do belong to two pub. series (one series being a sub-series of the other) but the system allows only one. And for the difference re: 'Heyne SF' vs. 'Heyne SF & Fantasy' see this discussion we had earlier. The publisher says 'Suhrkamp Taschenbuch 3847' and 'Leinen'. 'Leinen' means 'clothbound'. I think it is a special unusual edition. The cloth-cover is hard enough to call the pub. type 'hc'. I date it up. I would propose to change the publisher from 'Paul Zsolnay' to 'Zsolnay', because that is the name all other pub.s by this publisher are denominated. As a rule of thumb it is the official usage to have only the last name, as with 'Goldmann' or 'del Rey'. There are always exceptions, but they should have a good reason, as with 'Reclam'. I have found Anthropofiction! - It is a little bit confusing.-------- The English title there is "The Man of The Year Million", the German translation is "Der Mensch im Jahre 1000000 A. D." ------- The German translation "Der Mensch des Jahres 1000000" in 'Kristallei' is slightly different but obviously from the same English text. I normalized titles. . .
uncredited - I will change it. It should be 'Thomas'. If you're only uploading a cover image please use this vastly simplified method. You have to use the Direct Upload Procedure for all other types of images. 'Durchsuchen' means 'search for' the image source on my computer. I accepted your submission of Die Erfindung gegen sich selbst and changed the OCLC reference to use "OCLC: " format. We are trying to use a standard format for OCLC and LCCN numbers and links in notes so that when someday we have a better solution for them, we will be able to find and change them all. While I was at it, I also added a link to the OCLC entry. Several varianting submissions . . .
. . . by you that I have put on hold: they would lead to new titles that are also in German and not in the original language, which would be alright, with the exception that they will lead to variants of variants (which aren't allowed anymore) once the original title is edited into ISFDB. Then the variants will have to be unmerged and made into variants of the original. It's up to you to decide if that's what you want to do: an extra load of work. "Der Moloch" is most likely Гомункулус. I can post the first couple of sentences from the English translation if you have the German version handy. Hi. The link to books.google.de that you provided in Gast im Weltraum did not work, bringing up a page saying the maximum views has been exceeded or something like that (Sie haben entweder eine Seite erreicht, die nicht angezeigt werden kann, oder die Anzeigebeschränkung für dieses Buch erreicht.). So since it is not a link that works reliably, I removed it and replace it with a reference to Spittel's book itself and "via books.google.de". That seemed to be the best way to document the source. Please feel free to change it to something you think is more appropriate. The "tag", which tells the browser (IE/Fire Fox/Chrome/Safari/etc.) to do special display processing. For an anchor, the tag is "a". The "link text", which is what the browser should display as the link for someone to see to click on (usually this will end up in a special color, possibly underlined, when displayed). In the all of the publication/title/etc. Notes fields, if you simply provide a URL, e.g. http://www.google.com, it will display as plain text and cannot be clicked on. Someone wanting to visit the page would have to select and copy the text and paste it into their browser to follow it. The HTML "a" tag must be used to turn it into a live link. Publisher change and price added . . .
Der seltsame Fall des Benjamin Button . . .
First, I feel it should be "ZBV-Taschenbuch" instead of "Ein ZBV-Taschenbuch". Second, I want to have a pub series per imprint, as the "2. Auflage" did run as a series of its own. Are you OK with the changes? Hello, Paul! I saw that you did an upload for a slightly different cover. What was your Intention with that (as even Deutsche Nationalbibliothek has the one we feature now)? Anyway, the file exceeded our size standard, so I had to delete it. If we come to the conclusion that this was in fact what was printed on the cover, would you resize it (or should I do so)? Thanks, Christian Stonecreek 18:38, 6 November 2016 (UTC) Paul-Heinz: Hello, please could you resize my uploaded image? Yes, this is the correct image of the first edition (1. Auflage 2001). The present image in isfdb appears on later editions. - Also the Word "Ariadne" does not appear on cover or data-pages of my edition. Thank you. Paul-Heinz. The correct one is that with the blazing eyes! Hallo, it is Tom Linckens (my son) - sorry for this error. I have it from my own copy. There is an other problem: I could not find th last number 92 of "Ullstein 2000 / Stories der Zukunft" (title of series slightly changed) - for the time being I cannot reach the copy for further datas. I also could not find Heyne Science Fiction & Fantasy 06/4074 - Anthology: The Last Man on Earth - "Isaac Asimov präsentiert: Der letzte Mensch auf Erden", herausgegeben von Isaac Asimov, Charles G. Waugh und Martin H. Greeenberg. Further datas: #8 of series; subtitle: Die besten Erzählungen zu diesem Thema; printed in Germany 1984; different translators: Walter Ernsting etc. For the time being I cannot do more, thank you. Hello Paul-Heinz. I have uploaded a cover scan for your verified and added the OCLC number in the notes. If you can retrieve a better scan than this one, don't hesitate to replace it ! Thanks, Linguist 14:55, 1 April 2017 (UTC). This page was last modified 18:49, 13 February 2018.